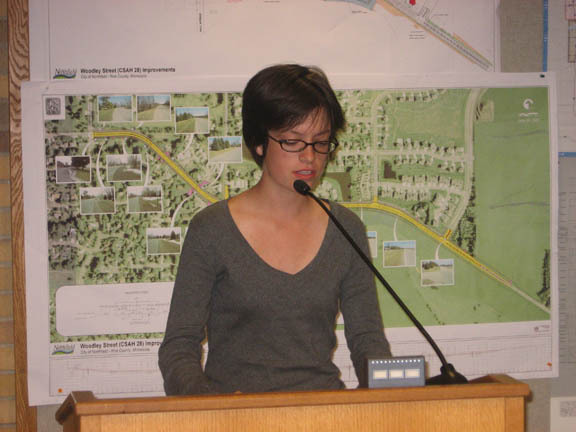 Today’s (Wednesday, January 23rd) Northfield News has a front page story about the progress of the proposed Skatepark. According to the article, many of the pieces are falling in place and the facility may find a home in downtown’s Ames Park. 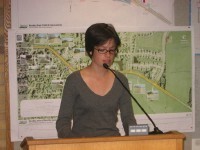 The NDDC hosted the Skatepark Coalition at its May, 2007 Downtown Forum. We were very impressed with the group’s research, analysis, and recommendations. Spokesperson Joe McGowan suggested that there would be economic benefits from such an investment, a theory confirmed by advisor Zach Pruitt, referring to his experience in Rochester. Apparently the City Council was impressed too. Pictured to the left is Coalition Member and Union of Youth Vice President Ruth Amerman speaking to the Council. …and/or write out a check.